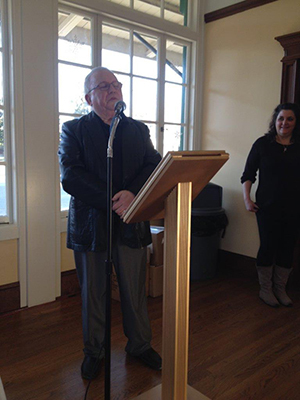 Portuguese Heritage Publications launched its newly released publication Power of the Spirit – A Portuguese Journey of Building Faith and Churches in California, yesterday May 23, at the Portuguese Athletic Club in San Jose. The book which has been selected as a finalist of the XV International Latino Book Awards, by the Cervantes Institute in New York was available for sale and signing by the authors. Following presentations by Editor and Co-author Joe Machado and writer-contributor Miguel Avila, hors d’oeuvres and refreshments were served. to those in attendance. Portuguese Heritage Publications of California, Inc. is a non-profit organization, created to research, preserve and disseminate vanishing memories and current relevant events about the Portuguese presence in California, for educational purposes. For more information about Portuguese Heritage and its publications, please visit us at: www.PortugueseBooks.Org and LIKE US on Facebook at Portuguese Heritage Publications. The Five Wounds Parish of San Jose and Portuguese Heritage Publications of California, invite the San Jose community to participate in a brief presentation of the book Power of the Spirit – A Portuguese Journey of Building Faith and Churches in California, Saturday April 27, at the 6pm mass and on Sunday April 28, at the 8am, 10:30am and 5:30pm masses. Representatives from Portuguese Heritage Publications will be on hand to answer your questions, they will also have books available for sale for those interested – A great Mother’s Day gift indeed! It took over 4 years to compile the history of the many churches the Portuguese built throughout California, from Immaculate Conception in Hawkinsville, to Saint Agnes, in San Diego, as well as the many churches in which they played a major role in its construction and parish leadership. The Power of the Spirit project involved 3 authors and over 30 volunteer researchers and contributors. In addition to the history of these 40 churches, the book includes short biographies of over 110 members of the Portuguese-American clergy who guided the spiritual lives of our communities for the last 150 years. This is a book that you will forever be proud to own and gladly share with your family and friends, for it encapsulates 150 years of the history of our forefathers’ ”Powerful Spirit”.